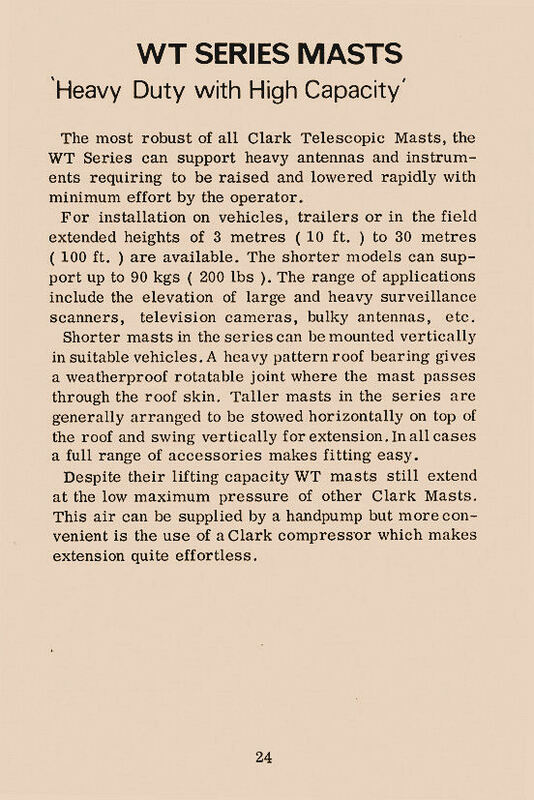 Illustrated in this web page, for historical purposes, are the WT Series Masts pages from Clark Masts early 1970's catalogue. 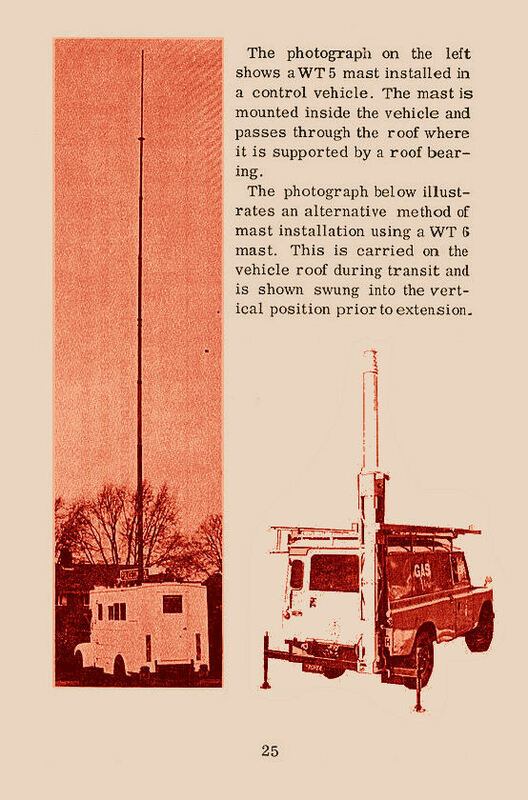 The Clark Masts WT mast series of the late 1960's - early 1970's was their heaviest duty series, consisting of 11 different models, all with keyed sections to prevent inter-section rotation, making WT masts suitable for use with directional headloads. 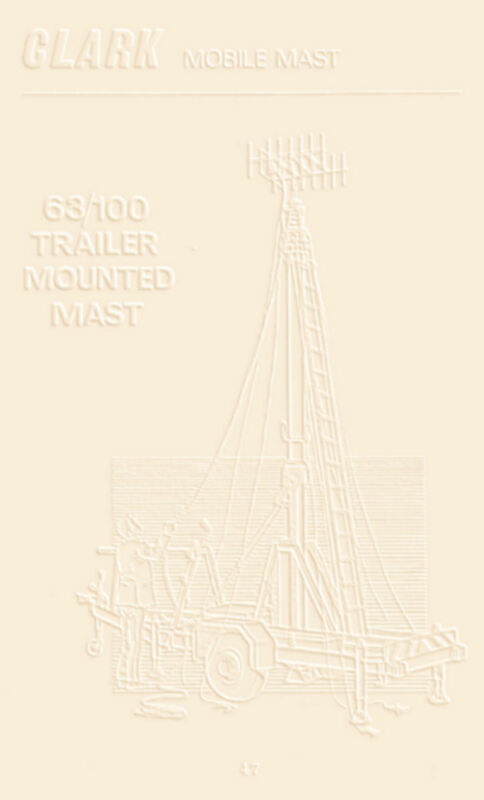 This early WT Series of masts was available in heights of 3.2 to 30.5 metres with headload capabilities from 11.2 to 136 Kg. Today's WT Series of masts includes a total of 140 models with heights from 3.47 to 30.57 metres and a headload capability from 12 to 120 Kg. As can be seen from above, WT Series masts were particularly designed to be internally vehicle mounted where heavy loads were required to be lifted up to 30 metres. Battery powered Air Source/Mast Controllers provided mast extension/retraction control. 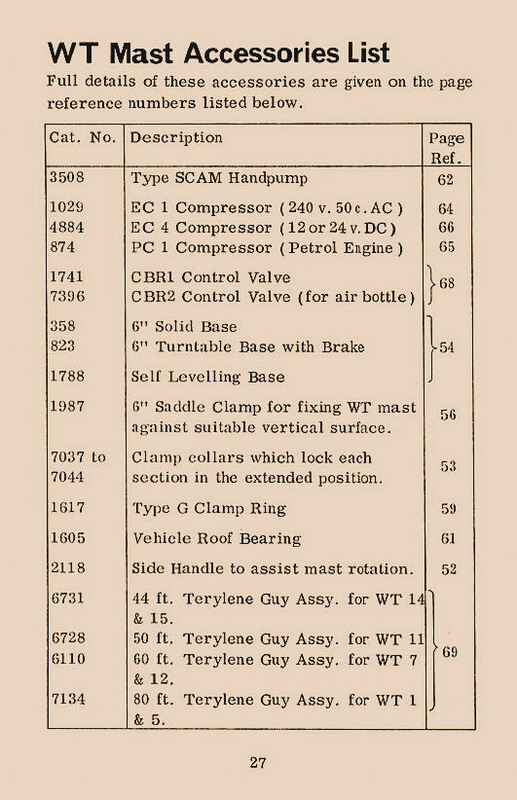 A Tripod field mounting option was also available for the WT Series as was a handpump for manual extension. From the table above it can be seen that Clark Masts early WT mast series were capable of operating, unguyed with 1000 square cm of sail area on top into wind, in wind speeds from 40 to 160 km/hr. If guyed WT models were rated from 80 to 160 km/hr. 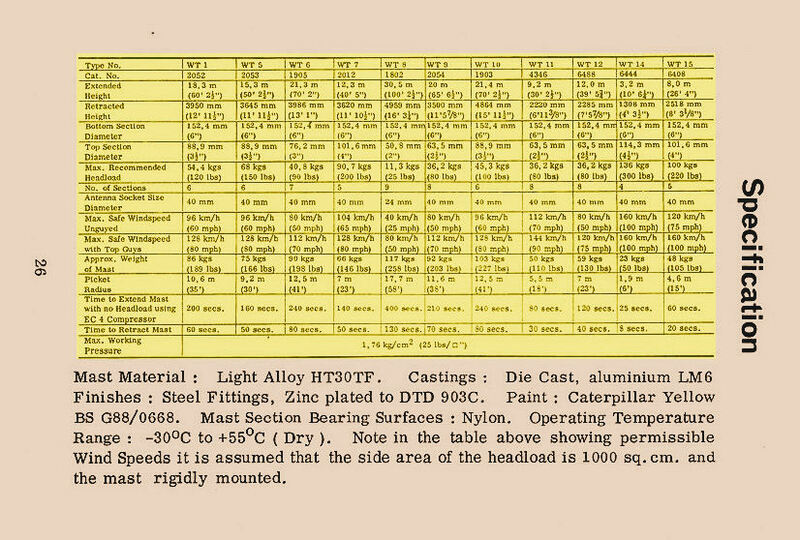 All WT Series masts had base tube diameters of 152.4 mm (6"), 38.1 mm (1.5") larger than the PT Series base tubes. 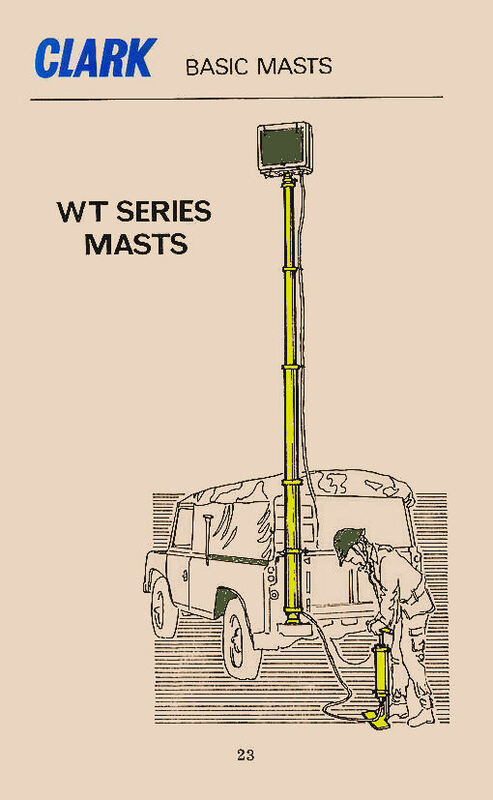 Unlike the PT Series, all masts in the WT series (except the WT8) had 40 mm sockets at their head with a quick clamp for attachment of their headload. The WT8 retained a 24 mm socket like the PT, ST and QT series. 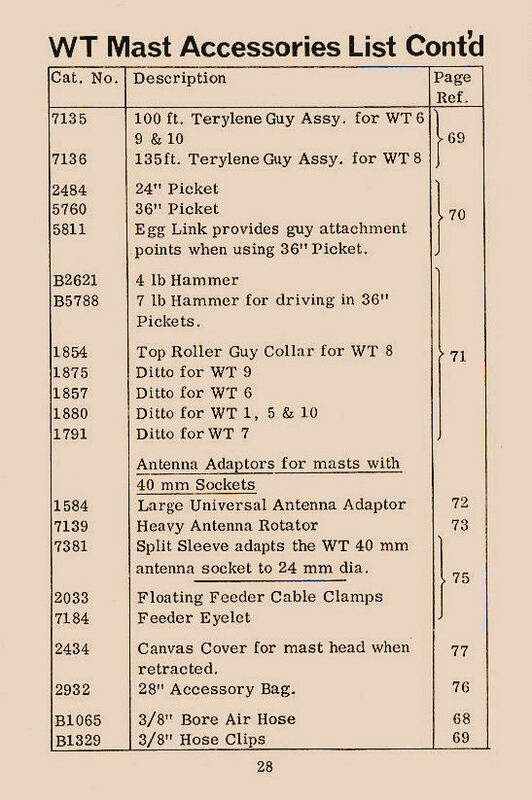 A range of accessories was available for the WT mast series which included mounting brackets for internal and external vehicle mounting, guy collars and guy assemblies as well as guy pickets etc.